Hmm, "Eclipse" - we like it, but what do you think? It's MSI's new foray into the high end with intimately cool dark designs, plenty of power regulation and oodles of features by the looks of things. 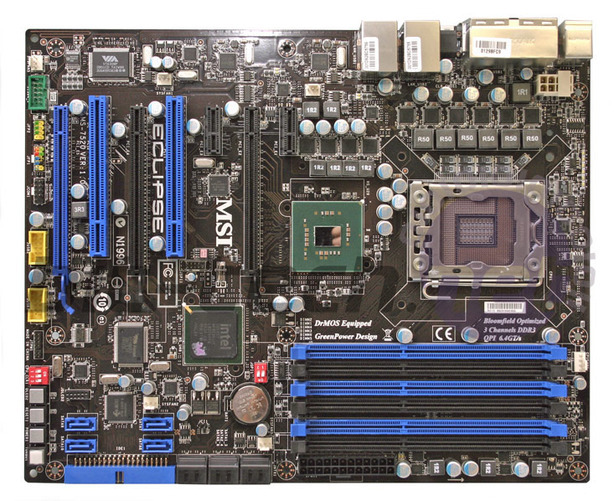 Since this is an early look MSI was keen to stress to us that nothing is yet set in stone on the brand front - currently Eclipse is a board name not an SKU level. Eclipse will sit at the "Diamond" brand level but there won't be just one X58 from MSI, there'll be three: Diamond SLI (with NF200), Eclipse (CrossFire only, like shown here) and Platinum (CrossFire only). There are six DDR3 memory slots that that support 24GB of memory. These are connected to the upcoming LGA1366 Nehalem socket that is powered by a 6-phase DrMOS power design. In a sheer numbers game though, it does seem low compared to the 16 from Asus and "virtual" 12 from Gigabyte, however MSI's P45 had five phase DrMOS and it worked perfectly well for us, in fact it was one of the most efficient boards we tested, so we can only expect the Eclipse to be closely the same. In addition to the DrMOS MOSFET + driver IC, there are the usual sealed ferrite cored chokes and the board gets all solid aluminium capped capacitors, although the CPU gets some low profile Hi-C capacitors instead. The PWMs are still powered by the common Intersil ISL6336 - the same that features on the Gigabyte boards. The northbridge and memory get a pair of phases for power regulation, although the chokes are smaller here. All the power regulation has MSI's third generation GreenPower behind it which can be controlled from both Windows software and natively in the BIOS, so it's agnostic of operating system and can provide power-saving from virtually the moment you turn on a PC. Even though MSI was behind with specific power saving hardware GreenPower is technically ahead of both Asus' EPU and Gigabytes DES hardware/software in this respect and the fact that it's phase switching is incredibly acute. In fact, MSI has branded this accordingly as "Active Phase Switiching", or APS.